Tell us about your characters to win BOOKS! Who doesn’t want to talk about their characters? We love new and interesting characters and can never get enough. And the My Hero flash character contest is your chance to show off yours! Share a 25-word description of your hero with us, and a panel of judges will pick out five finalists to post on the Kobold Press website. (Do you mostly GM? Not to worry! 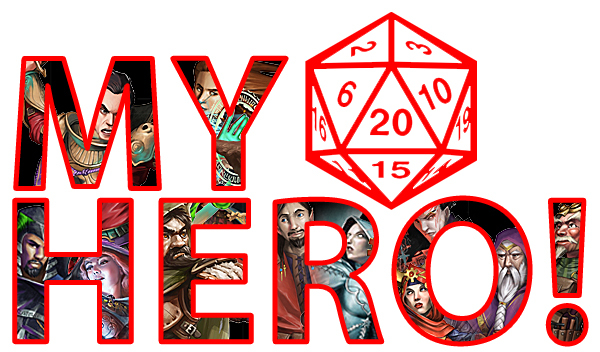 You can send us your favorite NPC description instead because NPC is just another name for the GM’s hero!) Then we’ll ask the public to vote on the entry they think should win the grand prize! The winner of the grand prize will receive the Midgard Heroes Handbook and Unlikely Heroes (print + PDF for both). So start with your character’s name, and then hook us with the details. Show us what makes them so rich and compelling. The catch is, it can be no more than 25 words, including their name. NO MORE THAN 25 WORDS! Entries over that will be disintegrated. Finalists: Midgard Heroes Handbook and Unlikely Heroes (PDF)—total retail value approximately $30. Grand prize: Midgard Heroes Handbook and Unlikely Heroes (print + PDF for both)—total retail value approximately $60. Our talented and experienced panel of judges are as follows: Wolfgang Baur, Marc Radle, and James Haeck. 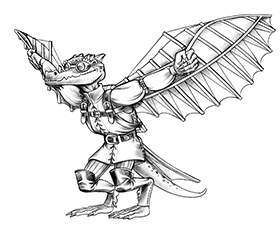 By submitting an entry to Kobold Press, you are entering the Kobold Press (the “Sponsor” or “Kobold Press”) My Hero Contest (the “Contest”). As an entrant, you (“you” or “entrant”) represent and warrant that you meet the eligibility requirements set forth in these Official Rules and agree to be bound by these Official Rules and any other requirements designated by Sponsor. The Contest is governed by U.S. law and is subject to all applicable federal, state, and local laws and regulations. If entrant is a minor in entrant’s place of residence, entrant’s parent or legal guardian must agree, on entrant’s behalf and on his or her own behalf, to follow and be bound by these Official Rules and all decisions of Sponsor relating to the Contest. Send an email with your submission to the “My Hero” contest at scott(at)koboldpress(dot)com no later than February 18, 2019. The submission must take the form of a single character description not to exceed 25 words and beginning with their name, embedded within the body of the email. One entry per person. The email subject line should read My Hero Contest Submission in the email’s subject line. Your full name and contact information and the entry should be the only content of the email. 3. Dates and Deadlines: Eligible entries must be received no later than 11:59 p.m. Eastern Time on February 18, 2019. Sponsor’s computer is the official time-keeping device for the Contest. 4. Who Will Win: On or about March 1, 2019, five (5) finalists will be selected by the Sponsor from all eligible entries received. All decisions made by Sponsor on all matters relating to the Contest are final and binding. The finalists will be notified on or around March 1, 2019, via the email address provided by entrant at the time of entry. If a winner does not respond to the notification sent to the email address he or she provided after two (2) notifications have been sent by Sponsor, such winner will be disqualified and will forfeit the finalist position. In such event, the finalist position will be awarded to another eligible entrant chosen from the remaining pool of entries in accordance with the terms set forth herein. Finalist prizes will be fulfilled approximately one (1) month after the conclusion of the Contest. 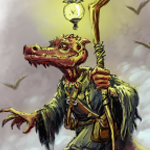 The finalists will be announced on the Kobold Press website, and then the voting public will choose an entry from among these five (5) to be the sole winner of the contest’s grand prize. Voting for the grand prize winner will close on or around March 11, 2019. As a Kobold Press buyer, Kickstarter supporter, Warlock Patreon and Arcamag Concept Creator I resent the exclusion of Puerto Rico residents in the contest. Hi there, I’m thinking about entering but I just wanted to know. The rules say “The submission must take the form of a single character description not to exceed 25 words and beginning with their name, embedded within the body of the email. One entry per person.” Does that mean the character’s name is part of the 25 word limit, or is it excluded? Dwalyn; honorable, loyal, dwarf who picks up the pieces after his friends have done something stupid, could be paladin, except sometimes stupid should be painful. “embedded within the body of the email” – as in, a text file? Curious how many submissions there were. Are you at liberty, Scott?